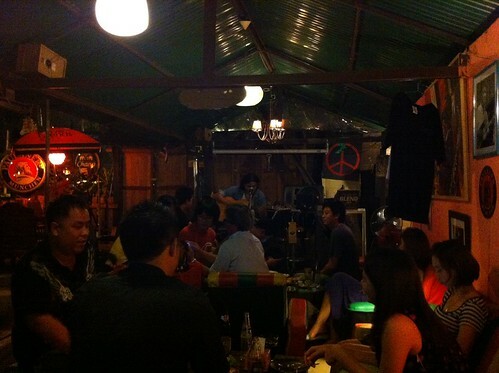 Blues 33 is a small bar on Suebsiri road, not far from Walrus Pub. Friends of mine says it's the best bar in Korat at the moment. I can say that music is very good, if not live, they have a great collection of music. The location on Google map is 14.954943,102.065992. Let me know if you have been in that place and what you think of it. I was there last Saturday. This is the owner of the bar playing some music, Ry Cooder style! They have Paulaner beer at 160 baht per bottle, big bottle. They also have Leo and St-Miguel only. I was told the food was nice but I have not tried it yet. -Open from 18 to 24, all day except Monday. Because they need to hang out somewhere else. - kitchen is closing at 23:30. You can get drinks until midnight....and sometimes a little bit after! - drunk people can't sleep over there for the night as they are not a hospital. - No service for bad customers or people that want to fight.